White smoke: Uncombusted fuel that has been vaporized and then discharged. 1 Late Injection, Timing Fuel is injected when the piston is in the down stroke. 2 Cold Engine, Ignition occurs late and combustion is prolonged. 4 Rise and Fall of Oil Pressure, Oil undergoes partial thermal breakdown. When fuel mixed with air during the ignition lag period (from the time injection begins until the fuel is ignited) reaches ignition temperature, the mixture is combusted in one burst. The pressure in the combustion chamber at this time rises as the quantity of the air-fuel mixture increases. If a large amount of air-fuel mixture is created during the ignition lag period, the pressure in the combustion chamber will rise rapidly. The pressure waves resulting from fuel ignition vibrate the cylinder walls and engine components, which generates noise. The generated noise is called “knocking”. To some extent, knocking is unavoidable in engines that use a self-ignition system. 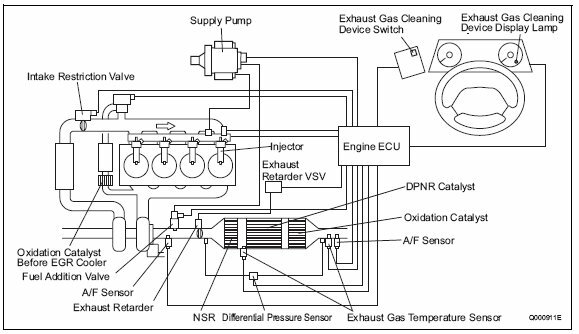 Power output adjustment in a diesel engine is accomplished by regulating the fuel injection quantity. Poor injection quantity control precision leads to increased exhaust gas emissions, noise, and poor fuel economy. For this reason, electronically controlled systems have been developed to ensure high precision injection quantity control. Reducing exhaust gas emissions and fuel consumption and optimizing the injection timing are important. It is extremely difficult to achieve the desired exhaust emission reduction levels through methods that adjust the injection timing according to speed (or centrifugal force), such as the conventional mechanical timer. For this reason, electronically controlled systems have been adopted to freely and precisely control the injection timing in accordance with the engine characteristics. The injection rate is the ratio of the changes in the fuel quantity that is injected successively from the nozzle within a given unit of time. As the injection pressure increases, the injection rate increases accordingly. 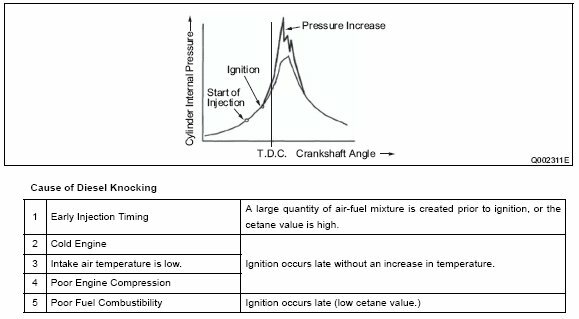 The increase in injection rate leads to an increase in the volume of the air-fuel mixture that is created between the start of injection until ignition (the ignition lag period). Because this mixture is subsequently combusted at once, it creates noise (diesel knock) and NOx. For this reason, it is necessary to appropriately control the injection rate by maintaining a low injection rate at the beginning of injection and supplying a sufficient quantity after the ignition. To meet this need, two-spring nozzles have been adopted and a pilot injection system has recently been developed. The fuel that is injected from the nozzle turns into finer particles as the fuel injection pressure increases. This improves combustion and reduces the amount of smoke contained in the exhaust gases. Initially, the maximum injection pressure of the in-line pump (A type) and the distributor pump (VE type) was 60 MPa. Due to advancement in high-pressure applications, there are some recently developed fuel injection systems that inject fuel at a pressure of 100 MPa or higher. The second-generation common rail system injects fuel at an extremely high pressure of 180 MPa.